I've set up google apps accounts many times before, and run into anything like this. Today I just set up a new google apps account, and have been going through the usual steps of setting up the domain settings. Usually, when you click on email, it has you set up mx records on your registrar. 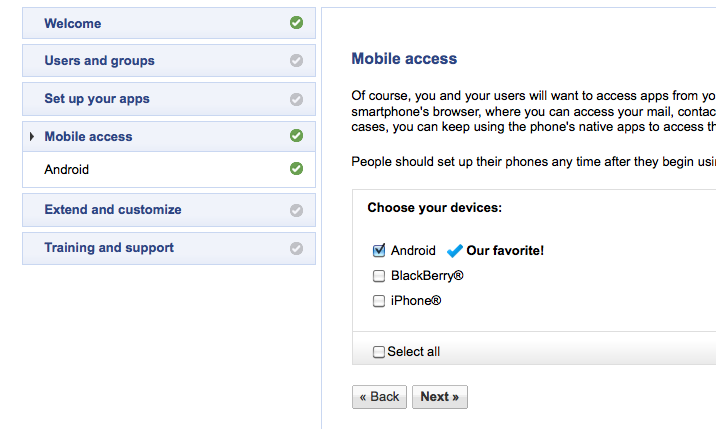 However, if I click on 'set up email', all it does is take me to the mobile setup tab. I can't figure out any way to access the actual inbox or instructions for setting up mx records. It's maddening. Anyone have a clue? Hopefully that will fix your issues. Not the answer you're looking for? Browse other questions tagged google-apps gmail or ask your own question. How do I send copies of e-mails to a handler script if my e-mail is hosted with Google Apps? How should we send our e-commerce store's email receipts and receive customer service emails? I have set a me@example.com to Google Apps/Gmail. How can I set a you@example.com?